The Sidney Glassman Memorial Award was created in 1985 to acknowledge outstanding leaders for their career contributions to the real estate industry on a senior management level in honor of the late Sidney Glassman, well known as Executive Vice President of Charles E. Smith Management, lecturer and author. The award singles out individuals for their exemplary work in areas of education, training, management, administration and legislation. Each fall, AOBA members are invited to nominate an individual they believe should be considered for the award. The Sidney Glassman Selection Committee, comprised of current officers and previous award recipients, submits votes and meets to confirm the award recipient. 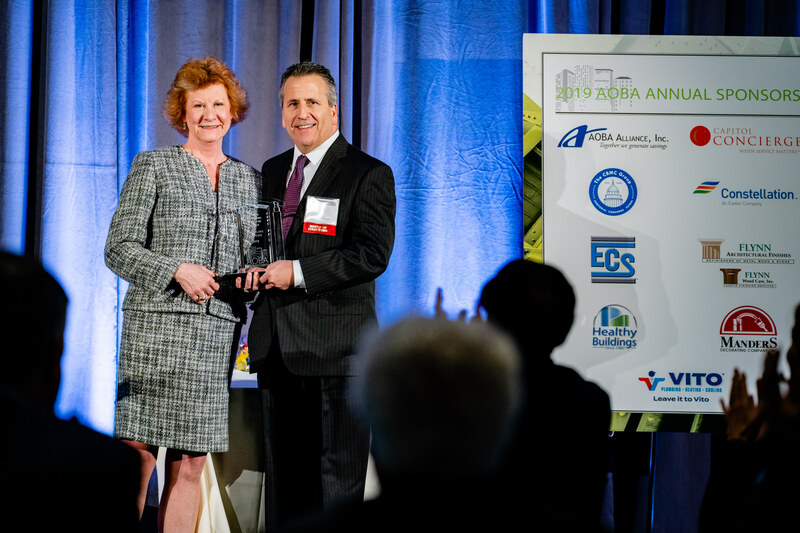 This year's 2019 Sidney Glassman Award was presented to Caroline Kruger, Regional Property Manager, at Boston Properties. Caroline has been a creative and positive AOBA leader for over sixteen years. As a longstanding Board member, Caroline has served as Board Treasurer, DC VP, VP-Commercial and as AOBA’s President in 2013. Caroline has made significant career and industry-wide contributions in each of these areas including her tremendous work she has done on behalf of the TOBY Awards. Her efforts have helped make the TOBY’s a distinguished and successful program for our region. Caroline, thank you for your commitment to our TOBY Awards!